Image caption The Caucasus Emirate tweeted a photo of Kebekov to mark his "martyrdom"
Russian anti-terrorist officials say their forces have killed a North Caucasus jihadist leader in a shoot-out in the troubled republic of Dagestan. Aliaskhab Kebekov, head of the Caucasus Emirate, died with two other militants after special forces surrounded a house in Buynaksk, the Russian sources said. Kebekov took charge of the militant group in March last year after the death of its founder, Doku Umarov. The group was linked to al-Qaeda, but Kebekov did not support Islamic State. The official Twitter feed of the emirate's Dagestan section - (@VDagestan_Arab) - also reported that Kebekov had been killed in a battle with Russian forces. However, there has been no official confirmation yet from the rebel command. Kebekov was also known as Ali Abu Mukhammad al-Dagestani. The Caucasus Emirate consists of militants fighting to set up an independent Islamic state in the North Caucasus. Islam is the dominant religion in Dagestan and neighbouring Chechnya. 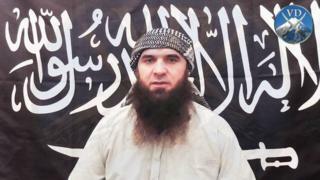 Doku Umarov had claimed responsibility for major attacks in Russia and had been Russia's most-wanted man. Reports say he was poisoned in 2013.